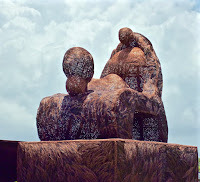 In Mumbai close to where I live there is a statue called “A child gives birth to a mother”. At first I thought this was an odd way of putting it, but the more I think about it, the more true it seems. I was certainly not ready to become a parent, but 25 years ago, when my son was born, I became one. This post is about growth. It’s one of the 6 qualities of character identified by Dr. Henry Cloud that make up integrity. Some people embody a desire to grow – they want to be more than they currently are and to make things bigger and better over time. This characteristic is different from the last one I wrote about, the ability to solve problems, because that is simply improving what already exists. Dr. Cloud defines these people as maintainers, rather than growers. He writes that it is a personal choice to invest in oneself and to grow, it is something that people need to engage in willingly. Growers have a different sort of drive than maintainers who continue the way they are day after day doing what is required of them. Growth involves taking risks. Risk-taking is controversial because not all cultures see this as positive – and because of that IB schools have the option to replace the word with courageous. However risk-taking, getting out of your comfort zone, can be very positive. Dr. Cloud writes, “risk means that you do something that has the possibility of a bad outcome, and that you embrace that possibility and are OK with it.” However this is not just a wild gamble – usually the risk is very calculated and is taken when a successful person gets to the point where what s/he is doing no longer fits with what s/he has become. At this point stepping away from the status quo is not really a risk but instead is “an expression of who someone has become, even if he or she is not sure of the outcome”. Reading through this chapter in the book Integrity reminds me very much of what we do at ASB in our R&D department. I’m continually feeling myself blessed to work in a school that has the foresight to invest in the future and that wants to become “more” than it currently is. Our R&D department looks several years into the future at the trends that will impact education, and then prototypes to get the school ready for them. Examples of this have been the BYOD and mobile devices prototypes, multi-age classrooms, internships and a revised school calendar. Our investment in these initiatives have meant that we have a completely different school from those schools who continue to do “business as usual”. In a nutshell, we are going out to the future before it comes to us. I’ve written before about how much I have grown and developed in the past 4 years as an educator as a result of being at ASB. I have continually been given opportunities to develop myself and hone my leadership skills. I have been encouraged to grow. Dr. Cloud writes about people who want growth seeking out mentors who are further down the road. This characteristic is markedly different from people who think they know it all and who do not ask for help. People with a growth mindset value the experience of others. To be mentored means that we are comfortable with becoming vulnerable, as we allow someone else to look at what we are doing. We are not narcissistic and don’t feel the need to “look good” – we need to be honest in order to grow. The mature character loves today. She loves what today has accomplished. Her soul is satisfied when she looks at the result. She is grateful for the accomplishment, proud of it , and grateful to all of those who helped bring it about. She thanks them, rewards them, and celebrates with them. The process is as important as the goal. Then tomorrow she will strive for more. People who grow jump in over their head. They try things that they cannot do, then stretch to become able to do what they are attempting. They take on challenges that ask them to become more than they have been or done before. Cloud also includes a section in this chapter about rest. He writes about a period of time each week, month or year when you are not producing anything. This is a time of regeneration or as he puts it: “fields need to be fallow to restore fertility for future harvests”. This requires a character that is capable of rest rather than one on perpetual output. If nothing is coming in or regenerating to make the future better then the future will simply be more of the same – in such a situation growth cannot occur. What is also important, according to Cloud, is to invest in the growth of others. He writes that successful people “not only subject themselves to mentors and people further down the road than they are, but they are also the ones further down the road for someone else. They give away what they possess and invest in others becoming more". The secret of success is simple: invest in becoming more than you are, and then pass it on.